One of my favorite ingredients in my fridge is goat cheese. When I started using goat cheese in my recipes, Jason would turn up his nose and not even try it. I knew he would love the tangy flavor of this awesome cheese, so I tricked him into liking it. I used it as a stuffing inside of chicken one night and he must have loved it because he was shoveling it in as quickly as he could. Half way through dinner I informed him that the chicken was stuffed with goat cheese. He reminded me that he hated goat cheese, but didn’t stop eating it. Now he asks me to make dishes with goat cheese all the time and he can’t get enough of it! Cook orzo as directed on package. 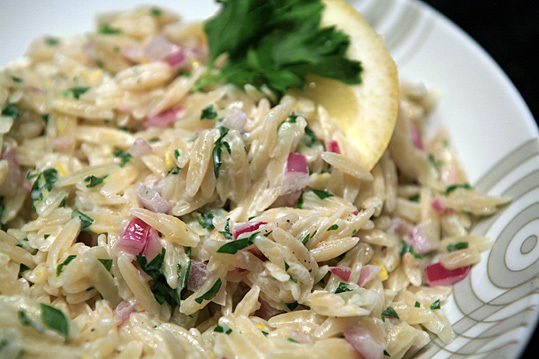 Strain orzo and pour lemon juice down over the hot pasta, toss with a drizzle of olive oil. Add in onion, parsley and lemon zest. Season with salt and pepper, toss together. Last, add in goat cheese and gently fold, allowing the goat cheese melt and coat the pasta. Allow to chill for at least 1 hour before serving. ← Let’s POP for Pop Chips! YUM!!!!!!!!! Goat cheese is hands down my favorite cheese EVER!!! !